I (Marianne) just came off the phone with the church, which is now booked! Every evening before I fall asleep I've been thinking "Gosh, we still haven't booked the church." And started worrying and not been able to sleep. But then in the mornings I always had something else on my mind, or simply forgot. But now it is done. This is our temporary wedding website. As soon as the invites are out (probably end of January, so start checking your mail box), andreasmarianne.com will contain much more information that hopefully will be useful for all our wedding guests. Jonathan Smårs has promised to help us create our wedding website, which we are very thankful for, but for now, here is our wedding blog with some of the basic information. The wedding will be in Linköping, Sweden August 1 2009. 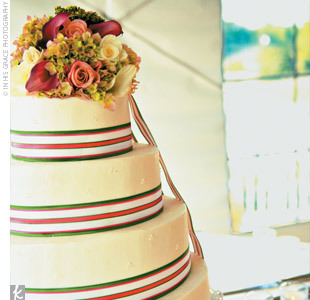 A round or square stacked cake with a few interesting add-ons is all you need for your cake. Consider adding polka dots to jazz up your cake, or topping it off with your grandparents' cake topper for added personalization.